Home Wind Power Kit- Is It Worth It, Or Not? Is It Worth It, Or Not? Wind is a kind of solar energy which owes its origin to the various ecological factors. The uneven earth’s terrains get unequally heated by the sun’s rays. This makes some regions of the earth warmer than the others. The hot air in the warmer zones becomes less dense and light and thus rises up. This upward convectional movement of the hot air creates a vacuum which is right away filled up by cold air from the adjacent cooler realms. This movement of air is called wind and the energy is called kinetic or motion energy. This kinetic energy can be captured and machinated by modern methods to get wind energy. There is a range of portable wind power generation devices, the home wind power kits, providing everything that is required for utilizing wind power for electricity generation. 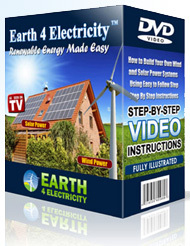 Home wind power kits: how do they benefit us? Wind power is in itself a very useful device in today’s world where cost of energy is rising by the day. And with the rising awareness of environmental eudemonia, wind power is being utilized more and more. Wind power although accepted widely across the world for industrial purposes, home wind power kits are getting introduced to make the maximum use of this wonder power thanks to the changing, rather evolving technology. Home wind power kits are really very economic and a smart way to regenerate power at your home from a completely non-polluting source, which is also unlimited in its supply. As people worldwide are realizing the numerous benefits of regenerating their own electricity with the wind energy conversion systems, the use of home wind power kits is seeing a steep growth. But of course you need to be a little patient about the installation and a little knowledgeable for the kit to function properly which is no big deal at all! The homeowner who installs a homebuilt wind power kit usually basks from the highly reduced electricity bill which is cut down by not less than fifty percent. An efficient home wind energy kit would rather cut down the electricity bill by even ninety percent. Also a good location of the house adds to the benefit of the homeowner as the extra electricity that is produced can be sold to the local utility owner. Thus the homeowner earns extra bucks naturally! The basic principle of a wind turbine is very simple. A wind turbine, distinctively consists of two or thee blades fitted to a rotor. The rotor is connected to a main shaft that spins a generator which produces electricity. Wind turbines meant for generating electricity are usually mounted high at a usual height of 100 feet (thirty meter) from the ground. Wind at such a height is much faster and less roiling, thereby providing a good output. The assembly of the readily available home built wind power kits is usually very simple. Else there are help options overflowing in the internet, wind power workshops, and even books. The rising expense of power is leading people worldwide to embrace wind power and home wind power kits being more affordable economically and practically are getting a better response. The advantages of a home built wind power system are plenty like saving power, saving the environment by not producing any air-polluting gases or greenhouse gases, saving money by reducing electricity bill etc. Talking about the disadvantages of the residential wind power kit, - actually there are none. Of course the initial cost of installation that could be a few thousand dollars might seem pricey, but when compared to the electricity bill and other fallouts of the conventional power plants and the benefits it offers in the long run, it is really a nominal one indeed. In few cases the installation might seem a little tricky, but can be easily settled with the help of a user’s manual that comes along with the home built wind power kits. Also some dealers offer many helping options like technical persons or even installation guide on their websites. Wind power home kits therefore are becoming popular by the day with the increasing power cost and awareness amongst the people worldwide.